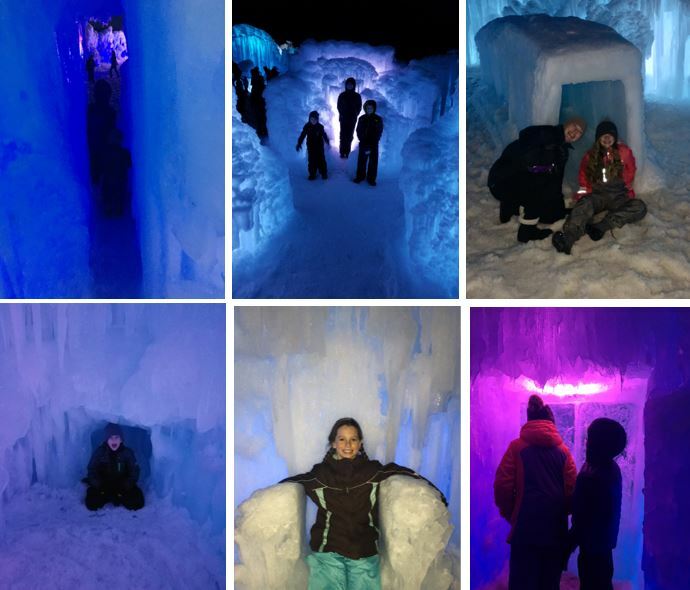 Ice Castles Review by Becky Vilos | Midway Ice Castles Last Weekend! Plus, my review of our favorite winter tradtion. 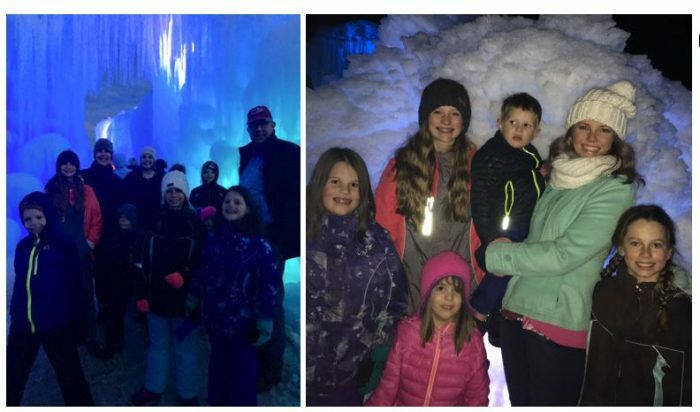 This is the 4th year my family has visited the Ice Castles in Midway Utah. It is amazing and magical every year. 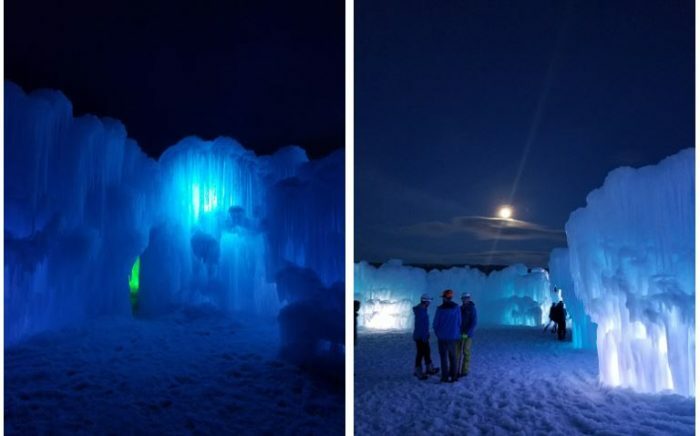 I was a little nervous it would be too warm for Ice Castles but they are still standing and are as impressive as ever. We invited two of my sisters and my parents to join us this year, because we just love them so much! This is their LAST weekend, because of the warm temps, so hurry and get your tickets! 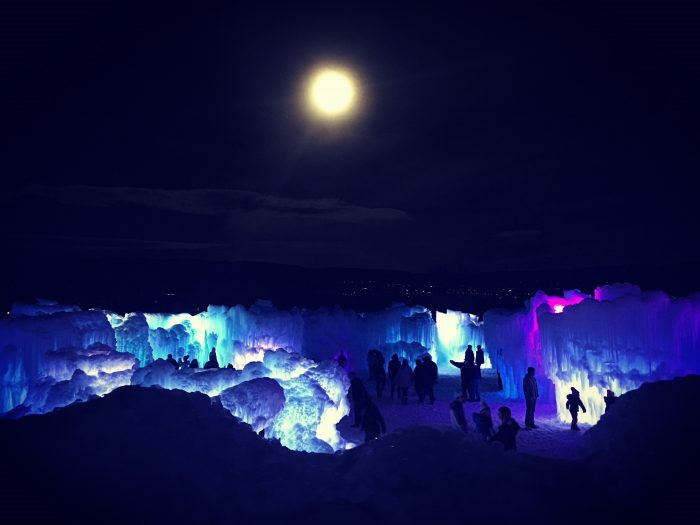 The Ice Castles are THE Place to visit this weekend. They don’t open till 6pm to keep guests safe from melting ice. There was a crew of helpful workers on site to make sure everyone was safe. I was concerned it would be crazy busy but it was fine. They have tons of parking and a tram that can take you to your car. The ticket line was fast too! I’ll admit the towers were not as tall as past years, but this year’s castle has the biggest footprint to date! They added some cool light features and the millions of dripping icicles were gorgeous. Plus, there were more slides, tunnels, secret passages and rooms to explore, than ever before. Because of the warmer temps we stayed and played for hours. Make sure you dress warm and wear snowboots and snowpants so you can go down the Ice Slides!! They are soooo fun. They had two big slides. One was so big you had to ride a snow mat. Ther were lots of little slides too! Evey year we go I am in complete awe! The colors, the formations, the slides, the music! This year we went on the night of the SUPER MOON! It was incredible. I could have stayed forever. I can’t recommend the Ice Castles enough! We plan on continuing to go every year. It just wouldn’t be winter without a visit to the most magical place in Utah. If you can’t go this weekend I recommend watching their Facebook Page for the latest updates. And when you see they are open, book your tickets for the first available time they have that fits with your schedule. 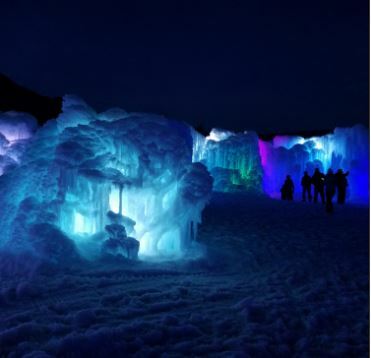 It is impossible to know how long The Ice Castles will be open every year since they are dependent on the weather.